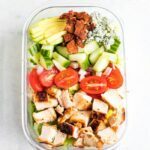 This chicken avocado club salad can be meal prepped two ways: in a mason jar or a meal prep container. It’s loaded with flavor, filling (thanks to chicken, turkey bacon, blue cheese and avocado), low carb and gluten-free. Welcome to Salad Week, party people! May is National Salad Month and I love salads, so of course I’m celebrating — or shall we call it salad-brating?! 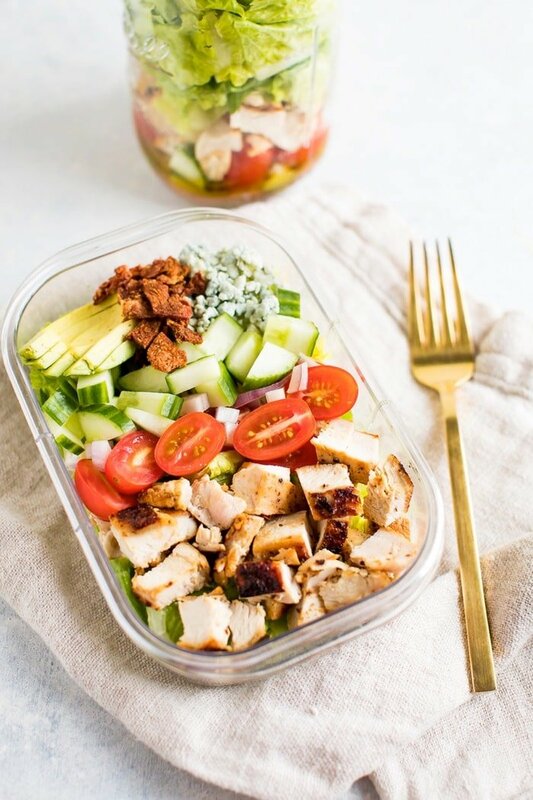 This week is going to be allll about meal prep salads on the blog, and I’ll be sharing FIVE new recipes and giving details about how to make them in meal prep containers or large mason jars. I’m also hosting another round of my 5 Day Salad Challenge. If you haven’t signed up yet, it’s not too late. Sign up here! 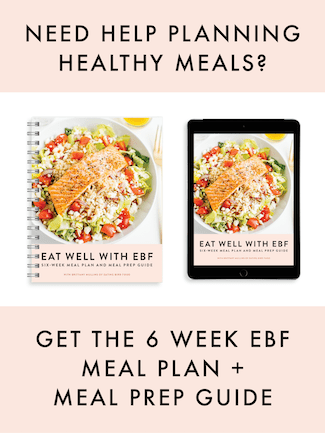 It’s free and the only commitment is replacing one meal a day with a meal-sized salad. 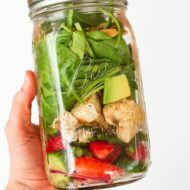 I personally love prepping salads in mason jars because you can throw all your ingredients into a large jar (including the dressing) and it’s ready to go! The hearty veggies that are soaking in the dressing marinate and get an almost pickled flavor, which I love! 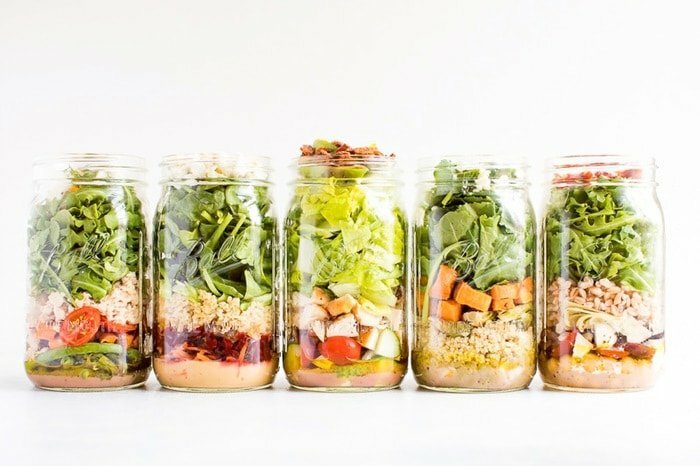 That said, I realize that everyone doesn’t have a slew of mason jars on hand so I’m also giving you instructions for how to prep these salads using regular meal prep containers. 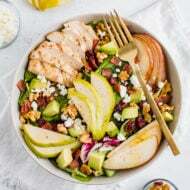 So the choice is yours and it doesn’t really matter which preparation method you choose — either way the salads will taste delish and you’ll be able to bring them just about anywhere. Take your salads to the park, take them to work, or just keep them in your fridge for a simple meal. 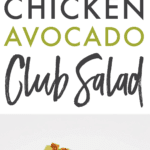 First up: chicken avocado club salad! I honestly don’t know if I’ve ever had a club sandwich (maybe once? ), but the combo of ingredients sounded fun for a salad so I’m rolling with it. This salad is so delicious and so satisfying — my two requirements when it comes to recipe creating. The combo of seared chicken (protein!) with the crispy turkey bacon, rich blue cheese and avocado is perfection! And I really feel like this salad could be adjusted so anyone would like it! Don’t eat meat? Skip the chicken and do tempeh bacon instead. Don’t do dairy? Skip it! This salad is versatile, so make it your own. Right now I’m digging super simple dressings like the red wine vinaigrette I’m sharing to go with this chicken club salad. The recipe makes a large batch, and the exciting news is that this dressing is used for four of the five salads I’m sharing this week. So go ahead and whip it up today because you’ll have plenty of opportunities to use it. Put the dressing in the jar first! You don’t want your dressing slowly dripping down all of your ingredients making them soggy over the day… unless you like soggy salads. 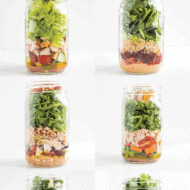 So remember: dressing in first and you’re well on your way to an amazing mason jar salad! I highly recommend using wide-mouth quart-size mason jars. The wide opening makes it so much easier to get your ingredients in and out of the jar. Plus the quart-size is large and perfect for meal-sized salads! 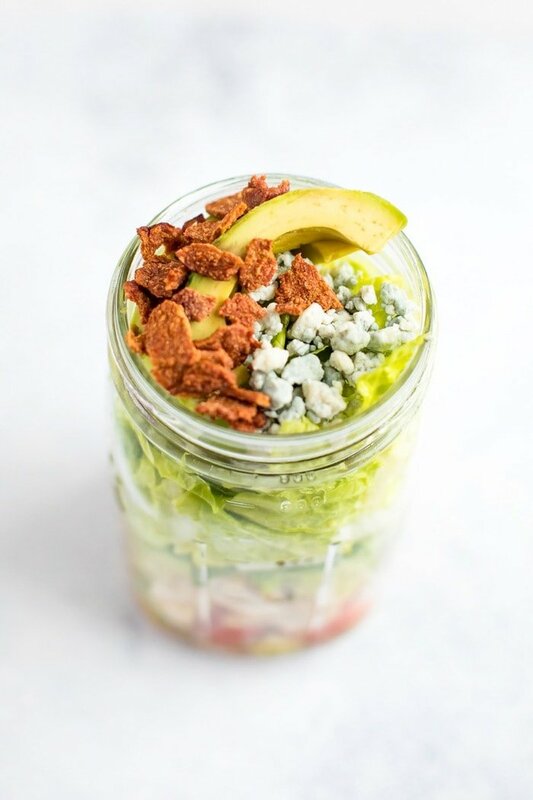 For serving, it’s way easier to shake and dump your mason jar salad out into a medium-sized bowl so you can easily mix and eat it. 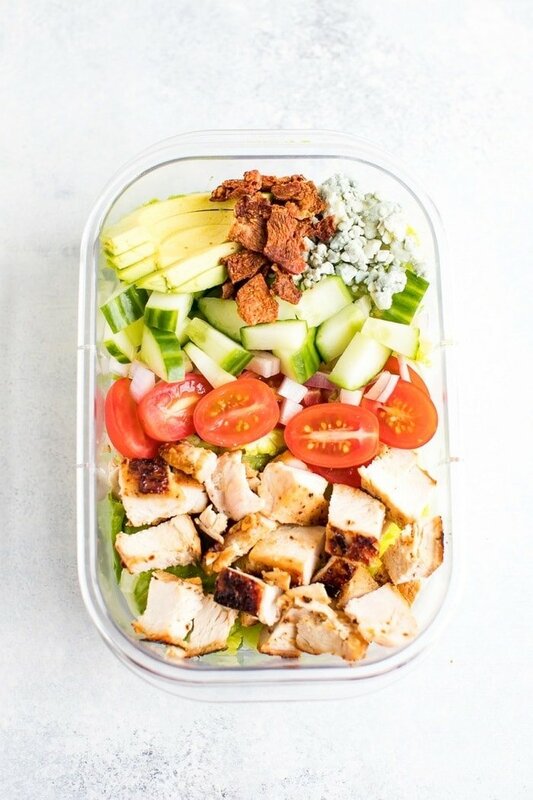 The meal prep version of the chicken avocado club salad is lovely as well. Just be sure you pack your dressing in a separate container if you go this route. Wouldn’t want you to end up with soggy lettuce! Season both sides of the chicken breast with garlic powder, salt and pepper. To cook the chicken, you can either grill it on an indoor or outdoor grill or sear it on the stovetop. To sear: add 1-2 teaspoons olive oil to a large skillet over medium heat. Place chicken breast in hot oil. Cook chicken about 6–7 minutes on each side, or until juices run clear. Remove from skillet and let sit for 5 minutes to cool before slicing for the salad. This step can be done in advance, and you can cook multiple chicken breasts together if you’re meal prepping. 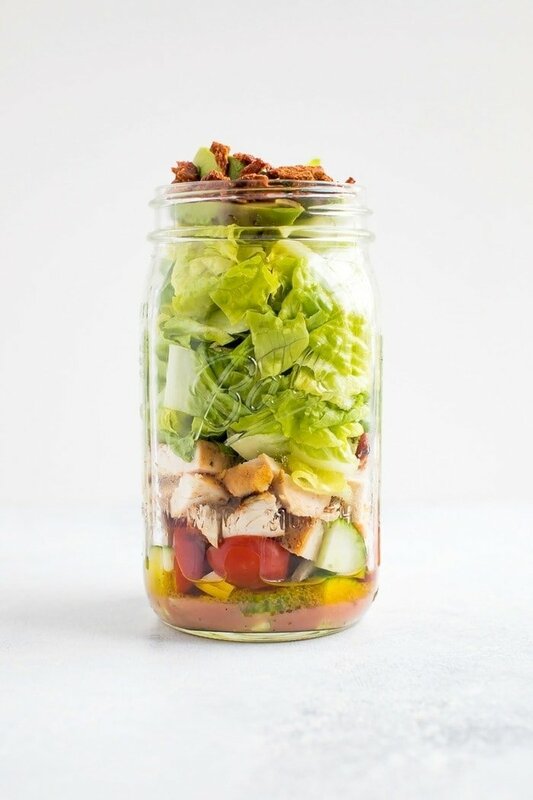 For a mason jar: Add 2-3 Tablespoons dressing to a large, wide-mouth quart-size mason jar, then start layering ingredients in this order: red onion, cucumber, tomatoes, chicken, romaine, turkey bacon, blue cheese and avocado. Avocado can be sliced and added the morning of if you’re worried about it browning. For a meal prep container: Line bottom of container with romaine and layer all ingredients in columns/sections on top. I recommend putting your bacon and avocado in separate containers — that way your bacon stays crisp and your avocado doesn’t brown. Store dressing in a separate container too. P.S. Unfortunately for salad lovers, romaine lettuce is on recall right now. It’s probably best to choose a different lettuce for this salad until we’re given word that romaine is safe to buy again. Love the salad options of my favorite sandwiches! I love having new salad meal prep recipes! I agree with you about the wide-mouth quart size mason jars…game changer! !